5 Gorgeous “Messy Hair” Styles You Can Master In Minutes! Woke up on the wrong side of the bed and want your hairstyle to reflect your mood? Instead of spending ages trying to tame the mess, embrace it! Let these messy hairstyles make you look gorgeous. And the best part about them? They’re SO easy to master! Image: Kayley Melissa on Instagram This hairstyle is perfect if you have mid-length hair. Step 1: Use hairspray generously over the length of your hair and sweep it back so that there is no parting. 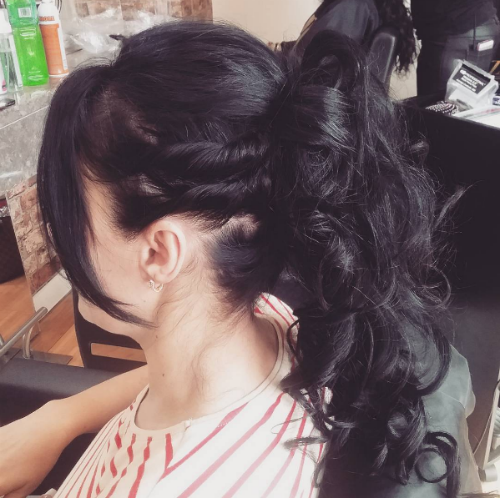 Step 2: Separate a section of hair from the top and begin making a french braid, taking sections from the front and sweeping them back as you go along. Step 3: Bring the braid forward to one side and finish it while there is still at least 4 to 5 inches of hair left at the bottom. Straighten the hair left at the end. Step 4: Gently pull the sections of the braid so it loosens. This will help with the messy look. Step 5: Twist up the end of the braid to make a bun and secure with bobby pins. Let the ends hang loose from the bun on one side for that undone effect. Step 6: Take strands of hair out near the forehead to complete the messy look and you’re good to go! You can watch the full video tutorial here. Image: Shutterstock Step 1: Comb your hair and make a side parting. Step 2: On the side with lesser hair, separate a thin section of hair and start braiding it where the parting begins. Step 3: Take this thin braid and pin it back with a pin. Step 4: Twist the rest of your hair into a bun at the back. Step 5: In the front, the side with more hair should have loose strands to frame your face. This will complete your chic messy braid look! Also read : 6 Beautiful Braided Hairstyles For The Long-Haired Girl! Image: Liwaldydsanchez on Instagram Step 1: For this hairstyle, you’ll need to curl your hair from the nape of your neck while the upper part remains straight. (You can also scrunch using a texturizing product if you don’t want to use heat). Step 2: Comb your hair back to remove the parting and take a section of your hair from just above your ear. Twist this section and pin it back. Step 3: Repeat the twist and pin routine with another small section right below the first one. Step 4: Gather the rest of your hair into a high ponytail. The curls will give it an awesome messy look! Image: Ronnabonifacio on Instagram This hairstyle by the original queen of messy updos - Blake Lively - is so gorgeous you can even pull it off for formal events! Step 1: Start by putting on a thin headband, like this one. Step 2: Separate a section of your hair from the front and pin it back, making sure that it goes over the headband. Do this on both sides. Step 3: Pull your hair back above your head and tie it into a messy bun like you normally would. Just the simple act of wearing a headband will give a whole new twist to your look! Also read : Pretty Hairstyles For Medium Length Hair… In ONLY 5 Minutes! Image: amber.aurora.mua on Instagram Step 1: Gather all your hair on one side and split it into 2. Step 2: Take a small section of your hair from the outer edge of one section and bring it to the inside of the opposite end. Repeat with the other side. Step 3: Repeat this process until the braid is done.